I signed onto the online classroom and got my first assignment. Holy cow, there’s a lot of reading already! Which shouldn’t surprise me, I suppose, considering there are four textbooks for this class. I’m not sure what I was expecting, but I think I was sort of thinking the first class would be a “hello! Introduce yourself” sort of class. Instead, we’re not only sprinting out of the starting gate right off the bat, the class is already half way around the track and here I am, just now arriving with my gym bag and still in my work clothes. I didn’t get a chance to sign onto the classroom (I’m taking an online class through a vocational college, in case you’re just tuning in), until late last night and I was surprised to see several people had already completed the first assignment! I feel woefully behind already, (I mentioned the class started yesterday, right?? ), and sort of in over my head. Though I read a bit last night, I was really too tired to retain a lot of it, the little that did sink in is, well, DETAILED! I mean, my reading comprehension is pretty decent, but holy brain overload, Batman, this is going to require a BIT more time than I had first thought. Which is fine, I’m determined to see this new career choice to the end, but I’m going to have to do some major mental adjustments here. 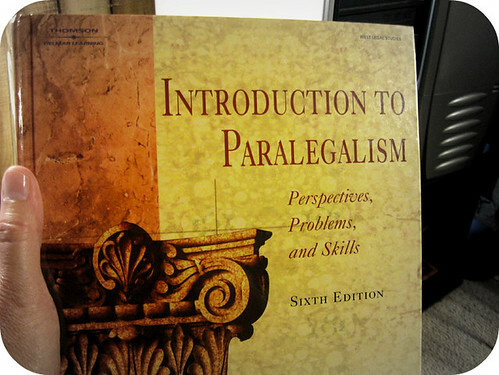 Welcome to the first lesson of the first course of the Paralegal Certificate Course. You should find this course to be enjoyable, challenging, and rewarding, as have thousands of students who have studied our curriculum since 1980. In this first lesson, you will learn about the foundations of our nation’s legal system. Your understanding of the derivations of our legal system is essential to your understanding of how our legal system works. We will first consider how our legal system evolved, and you will understand the difference between a natural view of law and a secular view. You will understand why precedence is so important to our court system, and you will learn the structure of the American judicial system. This is followed by four more online pages, as well as two sections out of chapter 6 from the book you see above AND suggested readings. Like I said, I’m up to the challenge, but I’m most likely going to have to make trips to the library just so I can get out of my comfort zone (i.e. house) and away from distractions (i.e. the Internet). My next class is tomorrow, where more reading will be dumped upon me. I’m not complaining, I’m really not, I’m just surprised that we’re setting the pace this early. But I’ll catch up and I’ll conquer this challenge because that’s what I do. (And I have to prove to Kevin that this is not a waste of time and money. There’s that). Anyone else watch Cupcake Wars? I really dig watching the Food Networks’ food challenges and the cupcake wars are just … well, they’re cute. Anyhoo … I thought it would be fun to highlight the Cupcakes from the Family Fun site in case anyone out there is hankering to decorate any cupcakes any time soon.